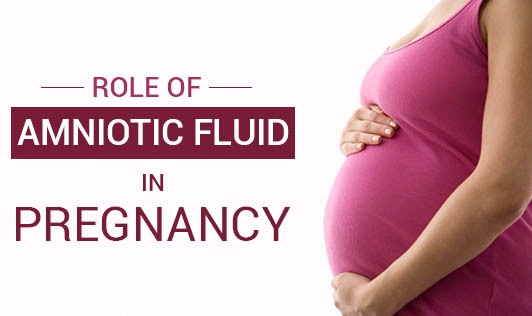 The amniotic fluid is a protective liquid present in the uterus of a pregnant woman in which the baby grows. This fluid mainly contains water and electrolytes, but by about the 12th -14th week (3rd month), the liquid also contains proteins, carbohydrates, lipids, phospholipids, and urea, all of which aid in the growth of the fetus. 1. Helps in improving respiration of the fetus and normal development of the lungs. 3. It allows for easier fetal movement and promotes muscular/skeletal development. 5. Amniotic fluid contains a considerable quantity of stem cells. These stem cells can be stored to treat health problems in the child. The amount of amniotic fluid is greatest at about 34 weeks (gestation) into pregnancy, when it averages 800 mL. Approximately 600 mL of the amniotic fluid surrounds the baby at full term (40 weeks gestation). At every week it increases accordingly. At no point, the amniotic fluid should weigh less than normal. The amount of amniotic fluid can be known through an ultrasound done by the doctors. If the amount of amniotic fluid is less than normal in the beginning of your third trimester, then your doctor will correct it by giving you suitable medications. There are chances where the sac carrying the amniotic fluid may rupture when you are nearing your delivery date, which is common. Contact the doctor immediately if you experience something of that sort.